I was recently thinking that the Technology innovation is increasing day by day, there are pros and cons in everything including Technology. Though there are many pros ignoring little cons, I was wondering how time flies using technology stuff across. Yes, there are many gadgets and IoTs that almost everyone across globe daily using them and grows accordingly. The time too flies with these gadgets and related technology usage. Almost everyday hundreds of new gadgets launches in many places with the help of technology and there is no limit for it. As we know the time is all about Smartphones, Internet and Laptop is going around beside travel related functions like Airline and its related gadgets innovation of the technology. I was recently noticed that one more new gadget launched, it is Air Purifier with Mosquito Catcher features. 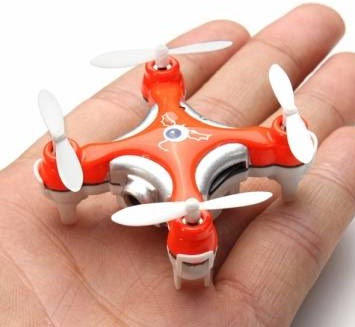 Some might have seen it already or few might have already launched this gadget earlier. However, it is too going on with the technology to clear the pollution around. The next one I attended the tech event was, all about Intel Xeon Scalable Processor that really helps the enterprises across globe. This is not for an individual but group to use the tech innovation and advancement. The next one is all about entertainment after personal or official work online or offline. Yes, when people get little free time, they do personal work or travel or enjoy the outing or listening music. This one is all about Tower Speakers from the latest technology advancement. Some listening the music either from Smartphone or the gadget mentioned above or related one. Now, Google also have introduced various gadgets, one of them is Google Daydream view other than self driving car using technology innovation. Neither XBox One X missing here. The technology helps in various areas like it helps commercial purpose and individual too. No area is free, all are busy and time flies. Considering some of these technology innovation, it let us feel that we people have no time to relax or time goes very fast than supposed to be. In fact, the time is always same but we are busy that time flies without our notice. Qualcomm is at aim on engaging with the academic community to encourage and support advanced engineering research. If you are looking for Qualcomm Innovation Fellowship Program contestants and winners 2017 then check this article for more detail. The participants and six winners detail is given below for Qualcomm Innovation Fellowship (QInF) program in India for the 2017-18 academic year. However, Qualcomm has a long history of supporting education, technology and rewarding them accordingly. QInF is financially supporting engineering schools, professors and students to advance their research and accelerate the development of key technologies. Avisek Lahiri and Abhinav Agarwalla from The Indian Institute of Technology, Kharagpur, recommended by Prof. Kumar Biswas and Prof. Pabitra Mitra, have been selected for their proposal on “Domain adversarial networks for bridging cross domain semantic gaps in computer vision”. Pratik Kalshetti from The Indian Institute of Technology, Bombay, recommended by Prof. Parag Chaudhuri has been selected for his proposal on “A deep learning framework for hand tracking with personalized dynamics”. Junaid Ahmed Ansari and Sarthak Sharma from International Institute of Information Technology, Hyderabad, recommended by Prof. K Madhava Krishna have been selected for their proposal on “Real-time monocular object slam system for dynamic road scenes”. Sayandeep Saha and Sikhar Patranabis from The Indian Institute of Technology, Kharagpur, recommended by Prof. Debdeep Mukhopadhyay and Prof. Pallab Dasgupta have been selected for their proposal on “Automating fault based cryptanalysis in secure embedded applications using machine learning”. Preety Priya and Sucharita Chakraborty from The Indian Institute of Technology, Kharagpur, recommended by Prof. Debarati Sen have been selected for their proposal on “Blind joint equalization and detection in presence of non-linearity and synchronization errors for millimeter wave communications”. Reneeta Sara Isaac from The Indian Institute of Science, Bangalore recommended by Prof. Neelesh B. Mehta has been selected for his proposal on “Novel selection algorithms to exploit spatio-temporal correlation in opportunistic wireless systems”. The six winning teams receive a financial award of INR 10 lakhs (approx. $15,000) each for the academic year 2017-18 and mentorship from Qualcomm Engineers. “This year, we received a large number of research proposals across a broad range of topics. We have been very encouraged by the response from the participating teams and especially the very high quality of the proposals,” said Dr. Dhananjay Gore, Senior Director Engineering, Head of Qualcomm Research India. You can also check similar IoT or AI or VR program from Unisys, ITC Infotech, Android Nano with Tata, Google and on. About Qualcomm: Qualcomm's technologies powered the smartphone revolution and connected billions of people. This has reference to earlier updates on Intel Xeon processors which was announced last Apr 13, 2017 by Intel on its latest development. Now, they have brought some more updates and its announcement as in below. Please find the latest news from Intel all about Intel Xeon Platinum processor and Scalable Processors readiness. India, 12 July 2017 – Intel India launched its new Intel® Xeon® Scalable processors, providing businesses with unparalleled performance to handle compute-hungry tasks including real-time analytics, virtualized infrastructure and high performance computing. If you are planning to invest in Data center or B2B or CRM related for huge memory then this is the best time to invest in huge core processors for huge memory, at Intel Xeon. This marks the greatest set of data center and network processor advancements in a decade. Hope you are aware that Intel already sold more than 500,000 Xeon processor to its reputed customers. Today’s general availability announcement follows Intel’s largest data center Intel® Xeon® Scalable Processors and they comes with high performance computing, cloud and communication services provider customers. In India, leading stock exchange - National Stock Exchange, and cloud service provider NxtGen have been a part of this initiative, and are expected to benefit from a dramatic performance increase of 1.65X on average2 over previous generation technology. Intel® Xeon® Scalable processors are uniquely architected for today’s evolving data center and network infrastructure – offering businesses the industry’s highest core and system-level performance averaging 1.65X higher performance over the prior generation. In growing workloads like AI, Intel® Xeon® Scalable processors deliver 2.2x performance over the prior generation. Designed to support an expanding range of existing and emerging data center and network workloads including cloud computing, 5G-ready networks, high-performance computing and artificial intelligence. Artificial Intelligence: Delivers 2.2x higher deep learning training and inference3 compared to the previous generation, and 113x deep learning performance3 gains compared to a 3-year-old non-optimized server system when combined with software optimizations speeding delivery of AI-fueled services. Networking: Delivers up to 2.5x increased IPSec forwarding rate22 for key networking applications compared to previous generation when using Intel QuickAssist and DPDK increasing the value derived from network transformation. Virtualization: Operates up to an estimated 4.2x more virtual machines13 (VMs) versus a 4-year-old system for rapid service deployment, server utilization, lower energy costs and space efficiency spurring enterprise data center modernization. High Performance Computing: Provides up to a 2x FLOPs/clock improvement1 with Intel AVX-512 as well as integrated Intel Omni-Path Architecture ports, delivering improved compute capability, I/O flexibility and memory bandwidth to accelerate discovery and innovation. Storage: Processes up to 5x more IOPS11 while reducing latency by up to 70 percent11 versus out-of-the-box NVMe SSDs when combined with Intel® Optane™ SSDs and Storage Performance Development Kit (SPDK), making data more accessible for advanced analytics. Other than this, Intel also introduced Intel Select Solutions, a solutions brand aimed at simplifying and speeding the deployment of data center and network infrastructure. This is customized solution for the customers based on the requirement of the business module through Intel® Xeon® Scalable processor configurations to speed return on investment to the customers. To learn more about the Intel Xeon® Scalable® processor, visit www.intel.com/xeonscalable, or visit http://launchevent.intel.com to experience a deep dive into the platform. Tips: The best processor for the enterprises in 2017-18 is Intel Xeon Platinum that comes with huge memory and extra cores, thus try to get the benefit out of it. Vivo Campus Carnival at Flipkart right now, this is what Vivo mobiles India has announced recently. If you would like to know more detail about Vivo Campus Carnival then find them over here. In case if you are looking for exciting offers of Vivo brand smartphone then this is the right time to go with it. 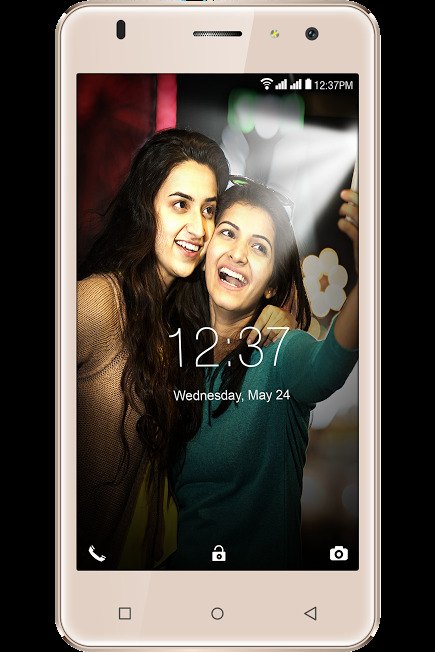 Yes, Vivo, the premium global smartphone brand took an initiative on first ever ‘Vivo Campus Carnival ‘on Flipkart. 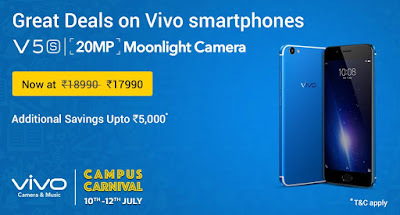 V5s great deals from Vivo Campus Carnival at Flipkart. The carnival will be for just three-day that begins on 10th July 2017 with as many exciting offers for all Vivo smartphones with flat discount of Rs. 1000 on its best-selling Model Vivo V5s. Not only this, other than discount and exciting exchange offers, the fans can also choose to avail up to 12 months no cost EMI on latest range of Vivo phones. There is a special 5% cashback offer across all credit and debit cards for customers who choose to pay at the time of ordering the phone. An extensive range of other exciting offers like BookMyShow couple movie vouchers (Rs.500), Go ibibo hotel vouchers (Rs. 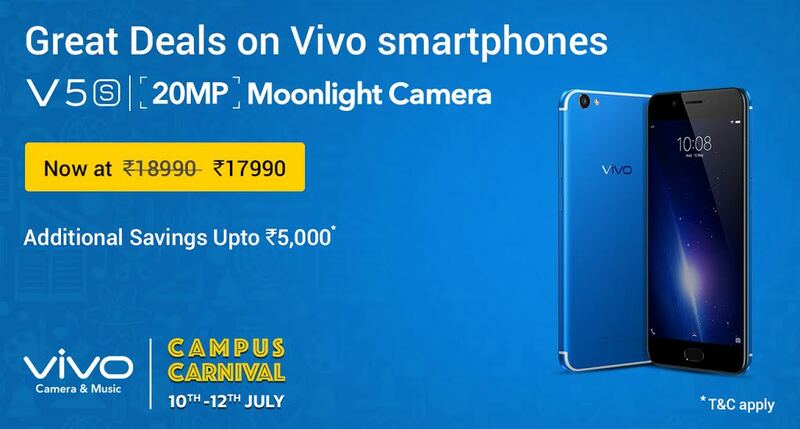 2000) and other overwhelming pricing options will be up for grabs during the “Vivo Campus Carnival”. And exchanging your old phone with price up to Rs 17K* with terms. Buy back guarantee up to Rs. 6400 on Vivo V5S and up to Rs. 8800 on Vivo V5 Plus for additional Rs. 349 and Rs. 499 respectively. Vivo Charms Smartphone Lovers with The Vivo V5s Energetic Blue Color Variant is available for the new and existing customers. 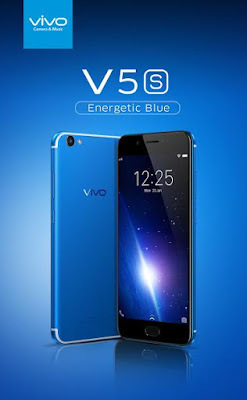 If you are looking for V5s smartphone detail then find V5s specification and V5s review. Tips: The best deal from Vivo detail can get by visiting its official website or social handling. So, try to visit and get the offer / discounts on-time without missing it. Would you like to know the latest Smartphone released by Intex Technologies? If yes, find Aqua S3 handset from Intex that comes with the 4G-Volte feature with 2450mAh battery aside. The device is powered by 1.3GHz Quad-Core processor, a high capacity charger (2Amp) that reduces charging time by around 35%; having Android 7 OS onboard. They all work together in a device for high on power and performance. Intex Technologies, one of the leading mobile handset player, unveiled its fast-charging smartphone model - Aqua S3 in Bangalore on 20th June 2017. The gadget comes with sleek looks and design to match the trend. Aqua S3 is powered with high 2GB RAM and 16GB Internal memory (with expandable memory up to 64GB) with 4G VoLTE features. Also, Aqua S3 comes with capacity charger that charges the 2450mAh battery at much lesser time to ensure endless entertainment and a running device. One of the latest and the best 4G smartphones right now is. The Aqua S3 device comes with 4G-Volte feature and a 5-inch HD IPS display that offers razor sharp display and striking images. The device ensures smooth performance, multi-tasking and boasts of the latest Android Nougat 7.0 OS. Aqua S3 has a powerful 8MP (AF) rear camera to capture vivid images and a 5MP (AF) front camera with LED Flash to click beautiful selfies in various modes. The smartphone, weighs just 165 gms. You will find more detail on the cheap and best smartphone 2017-18. The device has introduced latest changes to the OS and its development platform, it display multiple apps on-screen at once in a split-screen view, support for inline replies to notifications, and an expanded "Doze" power-saving mode that restricts device functionality once the screen has been off for a period of time. The device comes with VAS services for the users, and the other one is QR Code scanner that decodes the QR code automatically and shows the relevant information with buttons for the next steps to be taken. One of the best security smartphones at the moment. 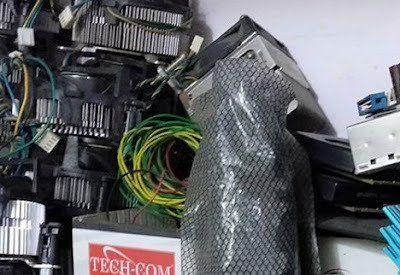 The gadget also comes with miFon security which is a 9 in 1 security suite, which helps when lost phone to track even when there is no phone data, missing phone siren, antivirus and data backup and even clicks selfie of the thief and emails the owner. Not only this, Intex Technologies has already released various gadgets including Intex Cardio smartband, Air-condition for Homemaker, Smart Home and Office Interior solution, Aqua 5.5 smartphone, Aqua Strong 5.1 smartphone, Cloud Q11 smartphone, Kids smartwatch, FitRist Pulzz, Aqua Power 4G device and on. Intex Aqua S3 price: Rs 5,777. Tips: Try to buy the smartphone which has more than 1 GB RAM and has good clock speed. You may find Intex Aqua S3 review anytime soon. Are you looking for the information on the latest entry-level 4G VoLTE budget Smartphone from lephone? If yes, find the detail of lephone, the Chinese Smartphone maker, released lephone W2 4G Smartphone in the market recently and its detail herewith. lephone W2 phone comes with 4.5-inch size along 4G features. The device is powered by 1.3GHz Quad core processor coupled with 1GB RAM and 8GB of inbuilt storage. lephone earlier released one of the smartphones with the name of W7 Smartphone series and you can check its detail too. 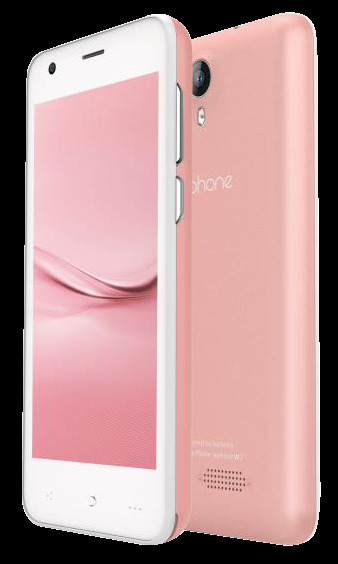 lephone W2 4G VoLTE Smartphone comes with 2MP rear camera with LED flash with a VGA front camera. The gadget built with 1.3GHz Quad core processor. The device is equipped with 22 Indian regional languages as well. 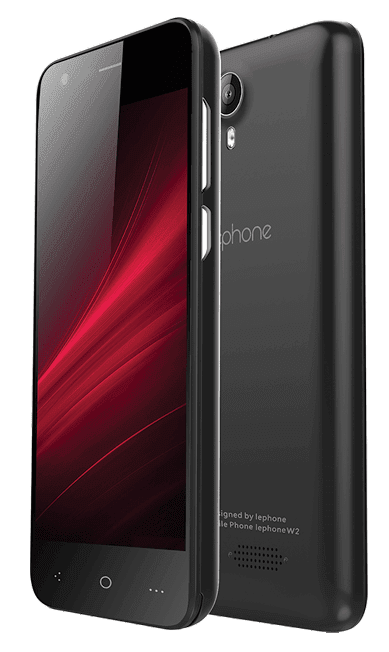 lephone W2 Smartphone comes with Android 6.0 Marshmallow operating system powered by “360” which showcases many features and useful apps like dual account support avatar master, 360 Clone, 360 security and much more. Memory Card: Expandable upto 32GB using a microSD card. lephone W2 review: It will be available soon. Stay tuned. Tips: Try to buy the smartphone which is more than 1 GB RAM and has good clock speed. Looking for information on how to set the AdSense for YouTube? If yes, please find the steps on YouTube monetizing to AdSense, detail below. How to earn from YouTube by monetizing AdSense? Click on Video Manager after click on 'My Channel' from the top left side Menu option before YouTube logo. You will see list of YouTube videos that you uploaded or blank if you haven't so try to upload to go with. You will see $ (dollar symbol with greyed out) icon for each video as shown in picture, which supposed to be in green color if monetized. Click on $ sign to monetize it / that video in particular - after that. The next screen will show at the bottom as "Monetize with Ads" push button greyed out as default, and you have to on it for blue color, it means it is just monetized for YouTube AdSense enabled after. Click on "Save Changes" button on the same screen at the top right side. The below screen shows the green $ icon after monetizing AdSense. You have to go through the same procedure for each video to monetize your YouTube for AdSense. Now, you would have understood the place where you could monetize your AdSense account for YouTube. The rest step is simple to as stated. Again stating that, you have to every time monetize it for each video uploaded so that you can earn revenue in case if you get organic traffic to YouTube video and few ad clicks naturally against the video from the visitors. How to unmonetize the AdSense account for YouTube? Kindly proceed with the same step given except last one and unclick the option given and save it to unmonetize the AdSense account for YouTube in case if you don't like to earn AdSense from your YouTube videos. Other easy way to monetize the AdSense account for YouTube. Go to settings and check the monetization status. In top right corner click on the account icon (grey color circle). Then go to channel status --> Features --> monetization. Tips: Try to upload the quality with searchable keywords video which shall run at least half minutes to two. Hope this article helped you. You may add comment if you have any query on this. Thanks for visiting. Would you like to know what is RicohDocs - 3.0 that was launched recently by Ricoh India? If yes, please find its detail over here. Ricoh India Ltd, a leader in the field of Imaging Solutions and IT Services, announced the launch of the next version of RicohDocs - 3.0 on 22nd June 2017 in New Delhi. If you are eager to know RicohDocs and its overall office automation function then please find herein below. RicohDocs - 3.0 is an office automation platform that enables users to manage all unstructured content and automate all business processes with absolute ease. Hope you can use this tool effectively for your office and business. If you are looking for the best office and business tool then here you go for it. This advanced office productivity platform helps organize the process of documentation and record creation, thus minimizing the involvement of professionals in the tedious regular tasks. RicohDocs 3.0 will help to ease the admin task too with enhanced user experience. RicohDocs - 3.0 is designed to assist organizations to create, store, collect, distribute, discover, archive and manage unstructured content. This tool might help for multi-tasking in one go. RicohDocs is a critical asset for every organization to lower risk, reduce operational cost. The tool would help not only to ease the task but reduce the cost in general. 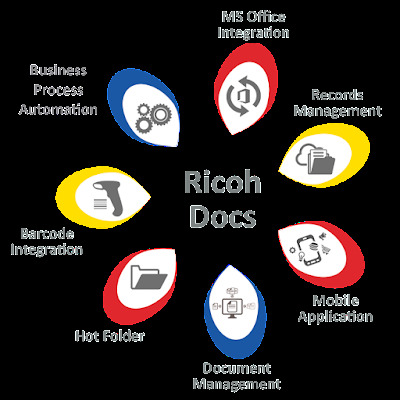 With the help of RicohDocs - 3.0 tool, the flow of business documents can be optimized through workflows made as per the existing business processes, thus ensuring an expeditious decision making process. How it works? RicohDocs 3.0, is equipped with various new modules and advanced features such as, file version comparison, sharing and preview of media files and bulk upload of files, etc. The multi-tasking from just one tool can help your business to do automated things effectively. This tool can work MS Office integration and Business Process Automation. The significant enhancements have also been made in user interface and user experience in the latest version of the RicohDocs - 3.0 platform. Other than this, notable enhancements have been also been carried out in the Hot Folder and Record Management System of the software. It basically works on various algorithm for the overall business works. While Hot Folder is a unique desktop application which stays synchronized to server and assures proper document channelization. It also helps to update the record within and monitored well across the access given. The Records Management Module helps capture, store and identify business records, following the record management policies and compliance, ensuring minimized risks. He further added, “RicohDocs 3.0 is an affordable, yet smart automation platform targeted at SMBs as well as functional departments in large scale businesses. This version offers matchless user interface and ensures a smooth business environment by easy management, smart monitoring, reduced operational costs, improved productivity". Tips: Try to buy the Office tool which can increase productivity or generate leads. These days we are depending on electronic gadgets like smartphone, tablet PC, Laptop or Desktop etc. It is though they are useful for various tasks but there are some unknown issues can happen too if you are unaware about it. You may know about Virus issues, Hacking or Cracking issues and all from the other end for your system / gadgets. Those issues are sometime avoidable and sometime not with those devices, but the issue begins on privacy matters too on few devices like Smartphone apps and its related. Yes, if you have the following questions in your mind then read the article completely to know whether you are taking pre-caution for the authorizing apps or not etc. Is Authorizing Apps in smartphone safe? Can I authorize known or unknown apps? Can I authorize and install unknown apps? Pros and Cons of Apps authorizing? How to be safer from Authorizing apps in smartphone? Which one is trustable apps to authorize and install in my phone? Is there security issue on Authorizing apps in Smartphone? There might be plenty questions as such from various users, however, as per the expert and techies on privacy issue on downloading apps from Smartphone with a small script. The simple and small script can take your all info from the smartphone or such devices like a Tablet PC or similar one where you authorize apps to install in it. The second one is, if you handover your smartphone to an unknown person for a while or specially any techie experts then they might just write a script to take entire info from it. So, be careful on this. It is up to individual choice whether to authorize the app or not after reading this article. I am not to advice you on this but it is your choice completely on this. It is again your choice to go with them, when privacy issue can happen from known authorized app then why not in unknown apps? It can be a route to hack or crack as well. If you don't care your privacy matter or security matter or the data (like Bank account, its apps etc.) saved in it etc. then blindly go ahead for it. Pros on authorizing apps is that you can use their offer and services effectively without any issue. Cons from Authorizing apps is nothing but your 'complete data' may or may not take from the device. They might have control over all those or some of those data. We are addicted to apps these days. Except cracker (than hacker) mostly no one uses your complete data other than you meant for them. Trustable apps also may take entire data from your smartphone so there is no question about it. It is users choice to whether install the apps or not. There might be security issues too on authorizing apps. Note: In general, Trusted apps never uses your data's except what you agreed for, however, they might use entire data when needed too. Tips: Try to install the apps which you can really trust or completely don't care for your privacy or the confidential data in your device.